Find a list of screenshots of common dialogs here. The context menu is the main way of interacting with TortoiseGit. In the following image you see several possible options. The options shown are tailored to the current context (e.g., "Add" is only visible for unversioned files and "Diff" is not visible here is only shown for modified files) - you won't see any commands that you can't use in your situation. There are also enhanced drag'n'drop context menus. 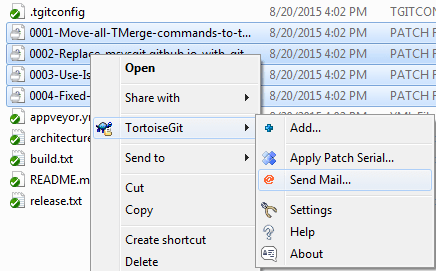 TortoiseGitMerge can open Git patch file directly, you review it and patch to working copy.